This lesson will guide you through using the advanced feature 'Translations' on a custom report. This allows you to change what you would like a report to state in a specific data column you have chosen to feature on the report. 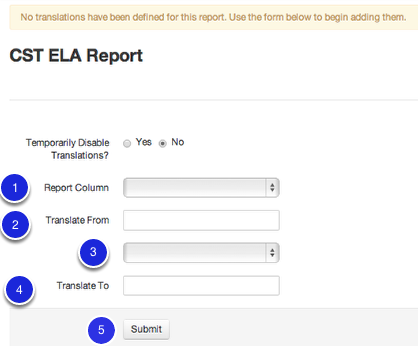 For example, if the data in the report says 'Special Education Program' and you want to translate it to 'SPED', translations in custom reports will allow you to do this. Note: You cannot group on translated values. Grouping will only affect the original, pre-translated values. 1. Report Column- Which column would you like this translation to apply to? 2. Translate from- What is it currently going to state in this column? 3. Is used if you would like to change blank fields in a column to a specific character or word, or all other untranslated values to one column to a uniform character or word. 4. Translate to- What would you actually like the column to state? 5. Click Submit to add the Translation. Temporarily Disable Translations- This allows you to "Turn off/on" the translations feature without losing any of your data. Type the current value that displays in that column (Male). Type what you'd like to have displayed in that value's palce (M). 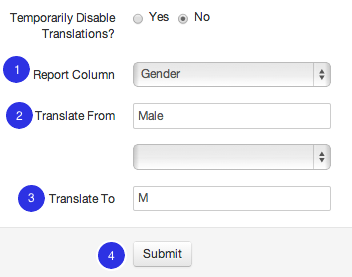 Once you've clicked Submit, your translation will show up in a list at the bottom of the page. From the list you can use the pencil/paper icon to edit the translation. You may also delete it using the red delete button at the far right. Learn more advanced custom reporting features in Advanced Custom Report Options.